so thanks to your guidance. I have avoided the default choice, of a wideband antenna, and installed an A group which gives a good picture. The aerial is in the loft of a bungalow and it`s on Rowridge. We`re very pleased with the aerial, there`s a big improvement on the old one, but we still get very slight break up when heavy road traffic is passing. As per your request a short note regarding the above aerial. I am in the south west of Scotland on the Clyde Coast receiving signals from Darvel, which is an A group transmitter. Specifically I live in Saltcoats and in a difficult area of that town masked from the transmitter by rising ground between it and my house. To compound things I wanted to fit the aerial in the loft but I do have a two storey house. Anyway I was using a high gain wide band aerial bought from Maplin but after some research and increasing frustration with drop outs I bought the XB10A from yourself and have just finished fitting it. I also recabled with satellite quality cable at the same time. Reception is so much better - I get green quality bands on all channels now and although signal strength has improved to 50% / 60% I guess there is still someway to go. I believe that Darvel will increase it's digital signal strength in 2010 so maybe then I will get a bit more. I have to say that I did not think that I would get such good results from a loft aerial and my fall back will be to get it mounted outside but I would rather not if I can avoid it. Anyway thanks again. The transmitter is Bilsdale which is about 36 miles away. The old aerial was a basic A group, about 2 feet long, 10 element. It was installed about 14 years ago about 5.8 meters from the ground. The picture was excellent, except for channel 5, which was a bit grainy. The new aerial (XB10K), is also about 5.8 meters from the ground. With the XB10K the analogue picture is excellent, except for channel 5, which if you look closely is still slightly grainy. Digital signal strengths are now all 95 to 100%. Your gain curves comparing the XB10K to the contract 10A look about right, I couldn`t get MUX6 (on CH42) at all with the old A group aerial. I didn`t like the quality of the wing nuts, as they were made of pressed metal and the threads looked a bit poor, so used BZP M6 nylon locknuts and washers. Note that post DSO MUXES 4, 5 and 6 will be out of the A group, not just MUX 6 as at present. Thank you for your prompt delivery of the two aerials that I ordered at the end of July. The aerials have now been installed and I can report that they are working well. The original aerial, one for Crystal Palace was a '48 element' Vision V10-481W/B - not ideal being wideband but it was all I had to hand at the time ! Crystal Palace is now being received by your XB10A aerial although about 1m higher than the Vision aerial. The signal levels (measured with a spectrum analyser on the vision carriers) with the XB10A were increased by between 3 and 6dB, average 5dB. As you can see there has been a marked improvement in the Crystal Palace signals, as was to be expected with a proper Group A aerial and a small height increase. I can now receive all 6 digital multiplexes from Crystal Palace whereas previously I could only receive 4 of them. I have to use Crystal Palace for DTT because Hannington doesn't provide much DTT signal Eastwards in my direction as it would interfere with some of the channels used by the relay at Guildford. The build quality of both aerials was good and the bracketry etc looked like it will stand the test of time. Also see the aerial report for the DY14WB (on Hannington) at the same site. Firstly, congratulations on such an excellent website with so much information. Following changes at Rowridge earlier in the year I found that reception on Freeview channel 37 was terrible giving a signal strength of 2 out of 10 but most days no signal at all. has been sorted out. Many thanks for the excellent service and informative website. First of all, thank you for your very efficient ordering service. I live in Tavistock, Devon. We have always had to receive our signal from the Tavistock relay transmitter with an external aerial (type unknown) with a masthead amplifier. Under analogue, the reception was rubbish. We could not pick up a signal at all from Caradon. After digital switchover (still with a masthead amp) our TV told us that signal strength was about 70% and signal quality 100%. The channels were limited. So I bought an XB10A from you for mounting in the loft. I found out that the aerial needed to point at 259 degs from north for Caradon. Our roofline runs at about 230 degs to north. I wasn't very hopeful that it would work. The roof has huge timber trusses that get in the way. The aerial is too big to fit in the apex of the roof so I mounted it about 4 feet above the joists as close to the roof slates (asbestos?) as possible. But it works ! The TV says about 60% signal strength and 90% quality. Even with no amplifier there`s no break up yet ! All the channels! Just one query, please. I mounted it on the L shaped bar with the long length running horizontally to the cradle (which is vertical). Would it be better if the L bar was vertical ? Thanks again. Just so long as the cradle is mounted perpendicular to the aerials elements the polarisation of the mounting pole/arm should not make much of a difference. Sony digital TV. Interestingly MUX2 was fine through a cheap digibox ! All the analogue channels were also OK.
Log40 with an XB10A in the loft and it cured the problem. No breaking up on ITV now ! I`ve used an XB10A aerial twice, fitted in the loft and split 4 ways with no problems at all. Digital sigs 55 dbµV + at each outlet, though this is a strong signal area. I have found the XB to be smaller than the yagis I`ve been replacing and therefore it`s easier to install. I like the XB10A`s build quality, although an F dipole connection would make life a lot easier. Maybe there´s a reason for saddle and clamp being used still? I`m not entirely convinced about F connections onto Yagi type aerials. They`re usually only waterproofed by a rubber boot which often becomes brittle and/or falls off (though Logs don`t suffer from this because they`ve got a cover over the whole F connector terminal area, but make sure you tilt them up slightly at the front ! ). Thus if any aerial we want to stock is available in "saddle and clamp" and F conn, we`d always stock the saddle and clamp version. Unfortunately some models of aerial are only available with an F connector fitting. Obviously the pros and cons of weatherproofing don`t apply to an aerial fitted in a loft ! Thank you for the aerial you sold us. The first class service, dispatch and delivery along with your most excellent and informative website. Its information is virtually an encyclopedia, well formatted and logically placed. being easily researched with well placed links and explanation sections. The XB10A aerial assembled easily as per the instruction sheet and was fitted in the shortest possible time. Appears to be well manufactured and well designed for assembly. Using the aerial to receive the signal for our digi (freeview) boxes it is a far superior signal now than with our old wideband aerial. The 16G pole I bought from you is also far superior than the one I have just replaced, following the description on your website I realise was probably a loft aerial bracket. The performance for both analogue and digital is ACE despite the signal we receive being transmitted from 40Km (25miles) away. have this kind of problem if you can actually see the transmitter). are on reduced power (it was at 2.5kW then ! ) till Sutton Coldfield switches over in 2011.
informative website I decided to try an XB10B (Moel has now reverted to a B group) indoors. to 91.2, though some are slightly up and some slightly down. helped me no end and without which I would have been lost. CH49 was particularly bad, in fact it was more or less non existent. The cable was satellite grade and the aerial was a 19 element Vision V10-191 Wideband Yagi (actually a only 12 element by “conventional” counting ! ) put up by an aerial installer in fact. A cheap crappy fly lead didn`t help and swapping to a decent quality one did improve things but not enough. So up went the XB10B, all of the digital is now better than it was and although MUX6 isn`t perfect but it`s far better than it was, it was hardly there at all before ! My old aerial was a Contract 10 wideband. It used to work well for analogue signals and OK 90% of the time for digital. That is until work began on Emley Moor in April 2010. As a result anything transmitted on Muxes 1,2 & D became unwatchable and eventually unobtainable. I fitted the XB10B in exactly the same place in the loft as the old aerial, set the direction with a compass retuned the TV and it worked perfectly. I have now had the XB10B working for a week. Firstly thanks for a great informative website, its heart warming to encounter such a complete information source created by someone who obviously has a real passion for his work, congratulations! The site lead to my purchase of an XB10K to try to resolve the poor reception at my parents place. On arriving here a couple of weeks ago, (been out of the UK for a while) the only channels were BBC and these had a poor image. The setup was a reasonable quality aerial, assume its a WB on an 8ft pole on the chimney running via a signal booster. The main problem is its a bungalow in a low position and the line of sight to the Wrekin is pretty much directly at the neighbours chimney and 2 aerials. (Sutton Coldfield is behind a hill that sits very close to the bungalow). I moved the position of the aerial a little and managed to get 42 channels on the Freeview box, not bad, but reception on the BBC channels was poor. but without the booster unit the signal is strong on all channels. BBC still gets the occasional bout of interference, but much better than before. Thanks ATV. Some positive feedback after getting me a good TV signal at last. I can thoroughly recommend the XB10K aerial. Well constructed and easy to assemble, it is a good choice for receiving transmissions from the Bilsdale or Emley Moor transmitters if, like me, you live down in the Dearne valley area of Barnsley and get bad reception. Hoping to improve reception from Bilsdale I replaced the ‘contract’ aerial with an XB10K X beam aerial. Helpful staff at ATV said the XB10K was also suitable for Emley transmissions, so before pointing the aerial at Bilsdale, I had a go at getting an Emley signal. I also changed the first 5 metres of cable as far as the 4 way masthead amp in the loft. It was the old brown stuff but didn`t seem to be in that bad condition. good and strong and my freeview quality says 90-95%. Totally impressed. Cheers ATV. You made my day. Excellent helpful advice. Quick service. A pleasure doing business. PS. Enjoyed the web site. Loads of good stuff. My dear old mum was paying a fortune for basic cable so we wanted to get her on Freeview. She’s 26 miles from Rowridge and behind a hill. The predictor sites all said it wouldn’t work and the signal has always been crappy. So, against all odds I decided to go for it and max out on the installation. So we brought the XB16A and everything to install it, cables, lashing kits, poles, connectors, amps etc. Fantastic aerial, top quality but what a monster ! You don’t really believe how big it is until it’s been assembled. Perfect signal ! In fact it’s so good we’ve now got it distributed around 6 points in the house. No problems at all and me dear old mum loves it. The real clincher was your web site. Gave me all the information I needed to do a very professional installation right first time. Spent a little extra on the best quality goods and the results have been well worth it. I’ve forwarded your web site onto a couple of friends who are also looking to do a similar installation. Many thanks. Aerial (XB16A) and bits arrived safely yesterday, thank you. Got it up yesterday (the aerial, obviously) and pointed it at Crystal Palace with my compass. Works much better than the old one but terrestrial still a bit grainy, possibly due to a tree the size of a battleship just across the road. However digital Freeview is so good that we receive programs that they haven't even broadcast yet. Thanks for the service and the info via your web site. Hello. I've recently purchased an XB16A from you and it would appear to have solved all my problems. I live at the bottom of a valley with Crystal Palace as my transmitter. Reception has always been very poor. Now on Freeview everything comes thru crystal clear. Analogue not so good but then I've not really played about with the new aerial. I've tried many wideband aerials (Maplin etc) in the past and spent a fortune with poor results. I found your site very informative & helpful. I've even in the past knocked up some A group Yagis and even some corner reflectors for neighbours (one mesh and one out of sheet). They're all OK but I'm the lowest house in the valley so in the end I gave up and bought one from you. As I say very, very pleased. Had an 18 element Log Periodic* with a built in amp before, pointing through loads of trees though. This gave high 40s to mid 50s on the digital signal quality with regular picture break up. Swapping to an XB16A (with a Mast Head amp) improved things dramatically. We now have mid 80s on signal strength and far less picture break.up, the analogue still isn`t much good though. The aerial is absolutely brilliant and money well spent ! and digital. Once we swapped to the XB16A things improved considerably. The analogue is better than it was though it is still far from perfect, however the digital is more or less fine now. We can watch TV again ! Our old aerial was actually an A group, but a small one. Swapping to the XB16A works better, the digital`s rock steady now, whereas before it was annoyingly intermittent. This aerial report is equally relevant to all A group transmitters (e.g. Rowridge). I had a Bacofoil XB10WB on Crystal Palace and the picture was appalling on both analogue and digital, even with an amplifier. I got an aerial installer out who messed around for a couple of hours, changed the amp (made no difference...), realigned the aerial, chatted to his girlfriend on the phone for 15 minutes etc etc. Finally he stated he couldn`t do anything and just moved the wideband aerial round onto Bluebell Hill. It was better but still not acceptable. He never tried changing the aerial and he didn`t even have an A group on the van (he works down near Crystal Palace and he didn`t have an A group with him, absolutely incredible... Justin ATV), but he still charged me a nice wedge into the bargain. When I fitted the XB16A I couldn`t believe the difference. The digital is (almost) perfect and the analogue is good on all channels apart from C5 (which is possibly due to restricted power in this direction), though even that is quite watchable. Incredibly this improvement is without an amplifier on the XB16A ! It is to be expected that swapping from a wideband aerial (any wideband aerial....) to a high gain A group [especially an XB16A ! ] will give a significant, or very significant, improvement. However Mr Douglas is quite lucky because it is rather less common to get an appalling (analogue) picture improved to a good one. Overall our key problem is being in a slight dip and the housing estate being surrounded by lots of tall trees. The house was built about 10 years ago and we had an aerial fitted at that time, it had to go on a 10ft pole on the chimney. The installer said it was the strongest gain available at the time. Then in April this year we lost CH50 (MUX1) completely, I guess it was the trees coming into leaf combined with high pressure. A few weeks later when it rained we got CH50 back but very blocky. So either the trees had grown more, or the transmitter`s power had reduced, but they claimed it was the same output power. So in May we had the old aerial replaced. The installer recommended a "Televes DAT45" (this is a "Tri Boom aerial"), and this was the one that I had replaced last Friday with the XB16B. The DAT 45 is a wideband but was still slightly better than the old aerial though it wasn`t able to give as good reception as the XB16B. So the advice on your website, about poor reception areas going with a narrow band B group for higher gain, and the review of the XB16B, clinched it. So, 10 year old aerial = BBC stations gone, and half the others also = 0 out of 10. DAT45 = BBC stations back again, but half the others were still absent = 3 out of 10. XB16B = All stations back again, but with one CH poor and one CH very poor = 7 out of 10. XB16E aerial performance (C/D group). XB16E aerial performance (E group). We`re on Craiogkelly and have trees in the way, but by putting the aerial in the loft I was able to align it between a gap in them. We were able to use the XB16K in the loft because we`ve got a big loft ! In addition we used a 4 way Mast Head amp to split it up there and I`m pleased to say it all works absolutely perfectly. We had a Contract 18 aerial on the chimney, but facing through a tree, the signal was poor. Unfortunately our house is ESE of Heathfield transmitter, and this may contribute to our low received signal due to the attenuation in that direction (abolished at switchover). The XB16E was fitted on a gable and made a huge difference, though to be fair it has a better view through the trees and we`ve also added a Mast Head amp. On the other hand the XB is now mounted lower down than the Contract aerial was. We`re on Angus transmitter and had a Log Periodic* aerial. Unfortunately it didn`t receive all the available channels and suffered from digital break up. The XB16E works better, giving more channels and less breakup. A loft Installation of the XB16K was required, it`s a very old property in a conservation zone – no external aerials permitted. 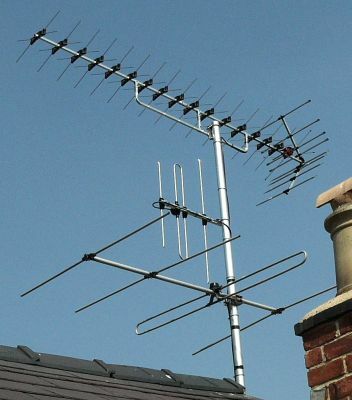 The original aerial was a ‘Maxview’ Contract 18WB aerial positioned at point A gave reasonable analogue reception but very poor digital reception, picking up only half of the available channels with frequent ‘drop outs’. Loft space in property very small with very restricted height but reasonable length, with the Wrekin transmitter site line very close to the line of the roof. 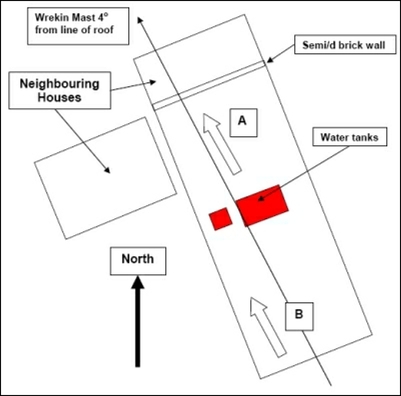 Tried XB16K in position B first, on the theory that the site line of the aerial would include less of the gable end wall of the neighbours (semi-detached) house. The signal quality actually proved to be worse than the original contract aerial set-up, possibly due to the two (plastic) water tanks and copper pipe work in the middle of the loft space, or whatever the neighbour had in his loft ? When the XB16K was moved into position A and signal strength and quality improved dramatically. Sixty Two digital channels/4 MUX’s became available, with only channels 53 and 57 (MUX’s 5 and 6) not currently available due to a deliberate ‘Null’ zone sent towards Bridgnorth to protect the analogue transmissions on channels 53 and 57 from the Brierley Hill transmitter. This result was also using the original, rubbish ‘low loss’ coax cable put in when the property was refurbished in the 80’s. This is due for replacement with decent grade cable as soon as the weather permits ! I expect the ‘missing’ MUX’s to correct when the Wrekin DSO happens in August 2011 and the ‘Null’ is removed. Overall, not the easiest of installations but absolutely worthwhile in terms of the final result. The quality of the aerial and connectors etc. supplied by ATV is excellent and only fully appreciated when side by side with the inferior article removed from my loft. The quality of information on the ATV website is superb and order handling, exchanging aerials and dealing with ATV over the phone has been completely painless. I shall be recommending you in the future. A valuable lesson in the importance of aerial positioning, especially in a loft ! I am living in the Bingley ( in the Aire Valley ) area equidistant between Idle and Keighley transmitters which are slaved from Emley. I purchased and installed the XB16K as recommended by yourselves. It is directed toward Idle and is receiving all terrestrial / digital signals perfectly, although I did change the cable at the same time and the old stuff wasn`t in particularly good condition. Previously I couldn't get analogue BBC 1 or 2 ( very weak) or CH5, also the digital channels were very patchy in bad or cloudy weather (and that was with an amplifier too). So all is OK . The only question I would raise it whether one clamp is sufficient to secure such a long aerial. It`ll be fine, provided the nuts are done up sufficiently firmly ! Our original aerial was a small Yagi on Midhurst which gave intermittent freezing on the picture and sound muting, which is a very annoying side effect of the digital system if you have a poor signal. The XB16E has improved the situation considerably, though we did change the cable as well as the aerial. get problems with the ITV channels, though the BBC programmes are better. Hi, I thought let you know how the XB16A worked out in the end. We now have typical signal strengths of 70%, and Qualities of 90 to 100% on all channels no matter what the weather conditions. The transmitter is direct through a row of mature trees, and even when in full leaf and it`s wet and windy there`s no problems. The aerial worked better than the previous Funke "high gain active" aerial, though that could be something of a red herring because that was sited on a different part of the house. The XB16A also outperformed the 30 year old Antiference 18 element A group aerial which was originally up on the chimney, but that was rather corroded and the cable was in very poor condition. I agree with you that it`s good practice to always change the cable. Maybe it`d be more in keeping with the XB16`s size to use a 2.0mm version of the 10ft x 2” pole ? I don`t think that 10ft x 1.6mm x 2" pole will ever break, I know people who only ever fit 1.5" 10 ft poles ! But if it does ever fail please tell us, and we`ll replace it free (and officially change our advice ! ). Here we have a horizontally polarised XB16A (the previous model but the new one has the same performance) at the top of the 10ft x 2" pole. In the middle there is a three element DAB vertically polarised. And at the bottom a 4 element FM aerial horizontally polarised. According to ukfreetv my home is right on the eastern edge of the Hannington reception area, it would be well within the Crystal Palace area except that there is a large hill blocking the line of sight. The new aerial was a replacement for a 30 year old wideband which gave barely adequate reception on the old analogue channels. The cable was about 20 years old and in good condition but "budget low-loss" type, badly routed (about 50% longer than necessary probably with kinks) and with unscreened faceplates - possibly losing 3 to 6dB by comparison with "copper-foil satellite cable", directly routed, no spurious connections and no face plates. Using a XB16B and a 4 way universal mast head amp kit, together with all new cabling, I now (post 18/04/2012 DSO) get near-perfect reception of all Freeview channels. Many thanks for supplying the kit. I live in a poor reception area for both Hannington and Crystal Palace, though most houses around here are on Hannington which we`re about 20 miles away from (SSW). My previous aerial was a Contract 18 (probably a B group) and it gave poor pictures on analogue, though the digital wasn`t too bad. I decided to go for an XB16B because I wanted to be sure I`d given myself the best chance of a good signal, and it`d still work reasonably well on Crystal Palace if Hannington wasn`t any better than with the old aerial. The XB16 gave a much better analogue picture than the Contract 18 and the digital is perfect, it hardly ever freezes or glitches. I was impressed, it was (even) better than I thought it`d be. On the other hand it`s a big aerial and I`ll now have to upgrade my pole and mounting brackets ! Even post switchover our digital reception wasn`t up to scratch despite the fact we`re only 35 miles from Sutton Coldfield. This may well have something to do with the fact we live in a bungalow with 3 houses directly in the line of sight and some trees beyond that ! The original aerial was a DAT 45 Tri-boom wideband on a 10 ft pole and I decided to try an XB16B to see what improvement this would bring. Whilst swapping the aerial I changed the cable as a matter of course (though the old cable was satellite standard and in reasonable condition) and upgraded the mast from a 1.5inch to a 2inch of the same length as before, due to the extra wind-resistance of the new bigger aerial (very wise). When the weather turned fine I got around to installing the XB16B array which you kindly supplied. I have to say I did find the cradle to be slightly loose in the clamp, so I packed out the tilting box section with a shim of aluminium, and all was well (I have forwarded your comments to the manufacturer. This problem is not unknown, for many types of aerial in fact, though I wouldn`t say it was common. For those who don`t have anything to use as a packing shim an alternative is to use a vice to slightly flatten the box clamp). The newer aerial was placed in exactly the same position as the old one. The performance of the XB16B (especially at the lower-frequency end) is certainly considerably better than the earlier DAT45 I have been using for around 4-5 yrs. This was exactly as hoped-for, so I am very pleased with this result and the overall benefits which are as good as or greater than I anticipated. Accordingly, the extensive advice available on your website has proved to be accurate and extremely useful, even though I have been playing-around with various aerials, myself, for at least 50 yrs now.